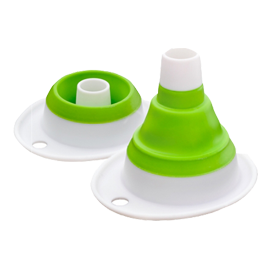 Starting solid foods with your baby is a new but enjoyable experience for both Mum and bub. I’m a few months off beginning solids with baby no.3, but can remember those moments when my other children really started to explore their world and enjoy solid foods. I use the word “enjoy” because they clearly loved making the mess far more than I enjoyed cleaning it up. None the less, it is an exciting time for everyone when you can try out new tastes, textures and experiences. Here’s a few ideas to get you up and running with solid foods for your baby. Here is further information on when to introduce different solid foods to your baby. When I started my babies on solids I naturally offered them ‘soft finger foods’ after their pureed vegetables, which at the time I didn’t realise was called baby-lead weaning, but I guess that’s what I was doing. So baby-lead weaning is when baby is provided with a range of foods at mealtime that they can then try to feed themselves with. The first few weeks could be sliced soft fruits and vegetables. Think bananas, pears, cooked pumpkin pieces and rusk sticks. It is all laid out on the high chair table and they explore their senses and learn with each bite. Yes it can be messy and you do need to closely monitor bubs while eating, but it is also very rewarding watching their wonder and excitement and growing independence. 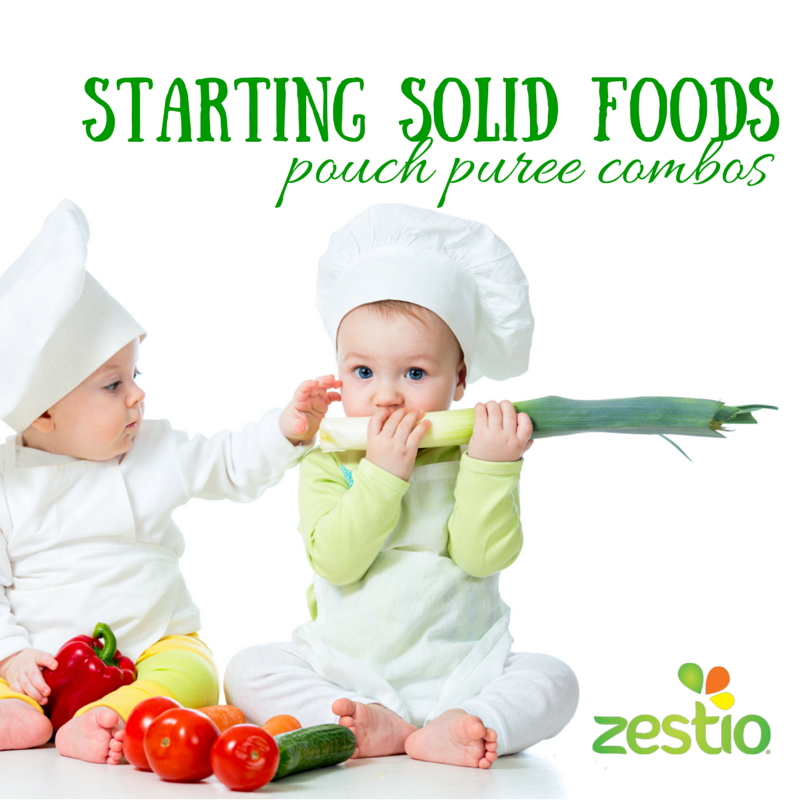 After a few weeks, my baby could hold a Zestio reusable food pouch independently and consume her own fruit and vegetable puree combos. 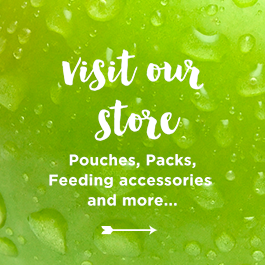 (I say one ‘baby’ instead of ‘babies’ because I was inventing the food pouch at this stage with my first child, but it was in action when my second child came along!) 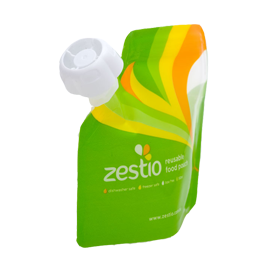 The Zestio pouch made it even easier for her to enjoy feeding herself due to the small square shape, while I knew the food inside was healthy homemade goodness. 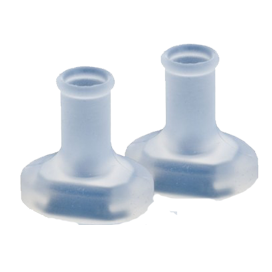 I also attached the innovative Zestio Pouch Topper to protect her little gums as she fed from the pouches. Looking forward to doing it all again soon with my little man! 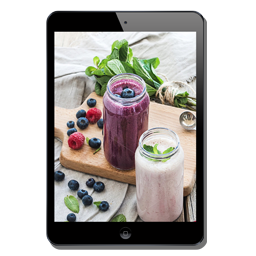 It’s recommended to try your baby on single foods first before mixing foods together, but when you do there are many great combinations you could try (ages to introduce may vary). And don’t be afraid to turn any puree recipe into a delicious ice block for summer, it’ll be heaven on their tender teething gums. We have Zesty Pops available online which are perfect for these icy cold treats. 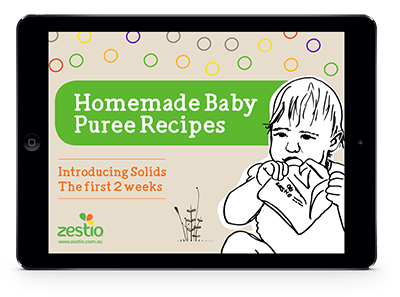 Enjoy starting solid foods with your baby!